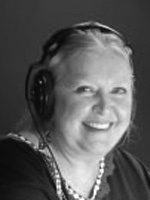 "Bobbie" Catherine Byers has narrated many talking-books for the American Foundation for the Blind as well as extensive commercial voice-over work. 03/17/1975 0240 Every Blossom Dies A young lady is murdered and the investigator leading the case becomes the main suspect. His boss is unwilling to believe the facts and his wife dismisses the evidence against him, one of them being a note from the victim herself. 04/15/1975 0257 My Own Murderer Joe Vinacelli is obsessed with murdering Joe Vincent. The latter goes into therapy to seek help as we slowly understand that the pursuer and the pursued are the same individual. But things get creepy when Vincent gives both his therapist and himself - the slip. 07/22/1975 0313 The Poisoned Pen When a group of people suddenly perish under after getting a strange missive, the thing that ties their circumstances together is that they each ridiculed a two-bit actress. 08/05/1975 0321 Hung Jury A mediocre accountant leading a double life is romantically entangled with a prostitute and knee-deep in gambling debt outside his normal world. When the bookies come knocking at his door, his real life is threatened. He comes across the solution to his problems when he is asked to serve jury duty for a crime he actually committed! 10/21/1975 0365 Million Dollar Murder A struggling businessman discovers his true nature and that of the people close to him when a rich woman asks him to dispose of someone for the sum of one million dollars. 03/05/1976 0443 The Infernal Triangle Finally free from her sister's shadow, Ann Fairchild has found happiness in the arms of her husband-to-be, Hugh Denning. A storm threatens her world in the former of her elder sister Eve, who has come home fresh from her latest divorce. Old insecurities resurface and Ann finds herself promising death should her fiancee fall prey to Eve's seductive charms. 03/22/1976 0452 Stampede With her husband murdered by Comanches and their farm razed to the ground, Ellie Tate Gottenschalk makes her way to Cheyenne as part of a cattle drive. 05/24/1976 0485 A Mexican Standoff An upstanding citizen finds himself the recipient of an all-expense-paid trip to Mexico from a mysterious sponsor and thinks it's too good to be true. Hell breaks loose when he is suddenly charged with fraud and even worse-- murder. 06/23/1977 0670 The Red Circle A middle-class housewife has an unexpected visitor who is an old friend from whom she has not heard in many years. The old friend has an incredible tale to tell that pits her friend against her old friend's husband. 07/26/1977 0689 The Rocket's Red Glare A scientist working on a top secret weapons project commits suicide in front of coworkers. A local cop suspects it was foul play and runs headlong into a case of espionage. 08/29/1977 0701 To Be a Rose A psychotic murderer kept incarcerated in a mental asylum recounts the days of him being a sensitive poet and how he fell in love. But his beloved broke his heart and drove him over the edge. 05/25/1978 0839 The Spy and the Traitor A fictional narration about the events surrounding Benedict Arnold's perfidy about West Point to Britain. 10/20/1978 0908 The Outside Girl Living off his wealthy mother, a good for nothing alcoholic becomes unusually attached to his father's portrait which he painted years ago. Upon waking from an alcohol induced stupor, he awakens to find the portrait gone, together with the new cleaning lady. Tom Mall looking for Bobbie Byers..U. Iowa 1962, knows Bob Bonnard, Iris Brooke...is this you? Am in contact with Bonnard...unwell and living in Brooklyn Hts. Just did a book, your name is in it, Iris Brooke and experience with Old Vic. If this is you, please contact me. A couple weeks ago I was burning some audio cds for a friend of mine for a Christmas present. He loves CBSRMT. He specifically wanted episodes with Catherine Byers in them. As the cds I was making him are a gift I was taking the extra time to print them with logos etc. As I was surfing around for a good picture to use of Catherine, I stumbled to her website. I wrote her an email thanking her for her work on CBSRMT as well as other things she has done. I thought it couldn't hurt to ask for an autograph as well for my friend. I told her I would love to talk to her about her experiences on radio and with CBSRMT and Hi Brown. She was kind enough to respond to my email. She thanked me for my kind words and said "It was a fun time to have known Hi Brown. He was a character." She made no mention of a possible chat with her. I mentioned it in a subsequent email as well but it again went unremarked upon so I will leave her in peace. I have attached the picture she sent me. I am not advocating that everyone write her and ask for an autograph. She told me she did not have any 8x10 photos anymore to hand-out but that she would print one for me. I bet she would be glad to get fan mail and maybe provide an autograph if you offered to send a picture or a script to her... I would have done that myself but she offered to print one and I didn't want to offend her. That's a lovely experience. thanks, tony. She also reads for talking books for the blind, and has done so for years. I hadn’t remembered her in CBSRMT, but she’s been a narrator on Talking Books produced for NLS for years. She’s a good narrator. Seems like she didn’t show up as an NLS narrator until the ‘80s sometime. And, didn’t she narrate for Dallas Taping for the Blind or one of those other outfits like that?